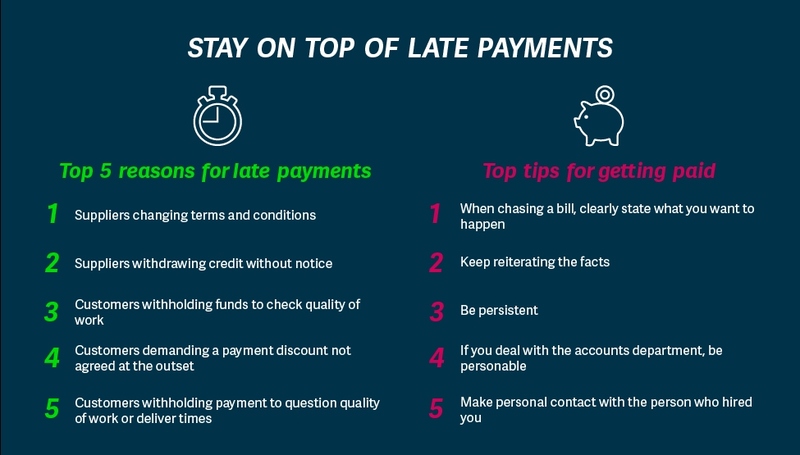 Late payments are a major headache for businesses across the UK. While large companies can absorb these debts, they often debilitate small firms. Over £55bn is currently owed to British SMEs in late payments and small businesses wait an average of 24 days beyond agreed invoice payment dates. However, small companies struggling to keep on top of late payments don’t need to be suffer in silence. Sage offers some advice to help you get paid on time. A change in terms and conditions typically happens because new businesses fail to write up a watertight contract with their supplier at the offset. If there’s nothing in writing, then there’s no proof. You need set out the conditions under which you trade very clearly, including timeframes, costs associated with late payments and acceptable payment methods. Always ensure the customer is happy with the quality of their goods immediately after receiving them and keep a record of this. Plan ahead by agreeing with your clients that complaints have to be reported within a certain number of days of delivery. If the customer is disappointed with the quality of only a small percentage of the products, you can offer them a discount but request for the remainder to be paid immediately. It’s common for suppliers to offer discounts for prompt payment or on bulk orders so you can’t blame your customers for expecting them. Even if you don’t plan on offering discounts, you need to discuss this at the start of your relationship to make sure you’re both on the same page. Make sure you always set clear credit limits with your suppliers. Having a good relationship with your creditors is important, so make their job easier by setting up regular payment plans and staying on top of your own payments. It’s good practice to follow up every delivery with a courtesy call to ensure that it was delivered on time and with no quality problems. This will save time in the long run and make it harder for your customer to complain at a later date. It’s important to be transparent about what you want to happen and to make sure your client understands your point of view. Stay calm, but don’t be a pushover. State the date you invoiced them, let them know the payment is overdue and set a new date for payment. Businesses are entitled to charge interest for any late payments as well as a debt recovery cost, so let your customers know that you will enforce these fines on late payments from the offset to discourage them. State when you invoiced the customer and your payment terms. Always get the facts right. If you sketch over the details – or worse, get them wrong – you’ll lose credibility and make yourself easier to ignore. Include your payment terms on every invoice you send and keep them consistent as this will help avoid confusion for both parties. Small businesses can’t afford to be shy about chasing late payments. It can be easy for clients to claim that they’ve missed emails or blame missed payments on administrative errors. However, physical meetings or phone calls are much harder to ignore. This means chasing on a regular basis and keeping records of any discussions to refer to at a later date if necessary. Lead by example. Business relationships are reliant on a little give and take, so treat suppliers the same way you’d like to be handled by your customers. Find out the person’s name and try to understand their point of view. Get to know your customer's payment dates and don’t ignore irregularities or delays. A working relationship with individuals within the company that hired you can pay dividends when chasing payments. Asking your contact to get in touch with the finance department or to have a discussion with the boss can often be more profitable than devoting time to doing it yourself. One way to save valuable time and money is to make sure you know your customers before doing business with them. Running a credit check on them can now be done online and could let you know of potential problems before you begin.